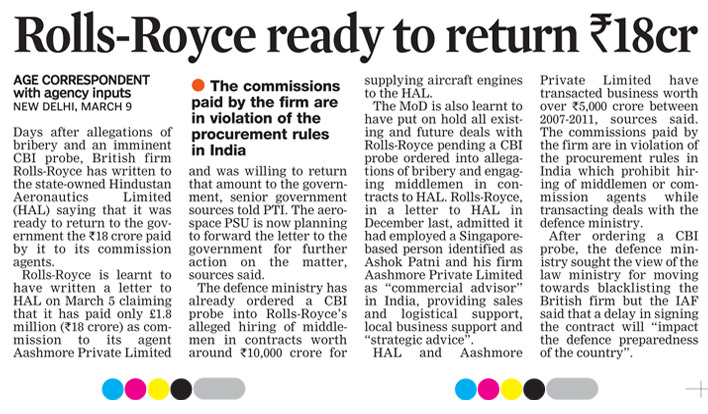 Under fire over an alleged bribery scandal, British firm Rolls Royce has written to the state-owned HAL that it was ready to return Rs 18 crore paid by it to its commission agents to the government. The Defence Ministry ordered a CBI probe into Rolls Royce's alleged hiring of middlemen in contracts worth around Rs 10,000 crore for supplying aircraft engines to the Hindustan Aeronautics Limited (HAL). Rolls Royce has written a letter to the HAL on March 5 claiming that it has paid only 1. 8 million pounds (Rs 18 crore) as commission to its agent Aashmore Private Limited and was willing to return that amount to the government, sources said. The Indian Mujahideen (IM) has been focusing on Nepal for its terrorist activities, according to a supplementary chargesheet filed by the National Investigation Agency (NIA) at a Delhi court. These activities include contacting the Maoists for the procurement of weapons, finding new terrorist operatives, making plans to establish hideouts in Nepal and Tibet and looking at private firms that provide training for recruitment into the British Army and the Singapore Police. The developments were revealed in the NIA supplementary chargesheet filed against the terror group at a NIA Special Court in Delhi on February 20. On February 24, the court had taken cognisance of the chargesheet filed in a case against the IM that was registered on September 2012. In the chargesheet, Ahmed Siddibappa alias Yasin Bhatkal, who is one of the founders of the IM, and three others -- Asadullah Akhtar alias Haddi, Manzer Imam alias Jameel and Ujjair Ahmed -- have been charged with carrying out terrorist activities against India. The NIA investigation has revealed that Yasin had allegedly made attempts to contact the Maoists in Nepal to seek their assistance, states the chargesheet. In another chat dated June 25, 2013, Yasin told Riyaz that he had met a senior Maoist leader, but did not find him useful. “Though he was Muslim, he was very haughty. He was claiming very high rates for the supply of weapons. Yasin mentioned that he did not talk about explosives, but they (Maoists) did have explosives which could be filled in tubes,” according to the chat. The chargesheet further reveals that Yasin and Asadullah had allegedly contacted persons in Nepal for allegedly raising a new module there to commit terrorist activities in India. In a chat with Riyaz, Yasin had informed him of a local man in Nepal who was “worthy” of being inducted into terrorist activities. “This person was in Qatar. Earlier, he was in Dubai and had lived with the Taliban. He is aged about 30, was a neo-convert who got converted about nine years back in Sharjah and was highly radicalised,” says the chargesheet. To further their terrorist activities, Yasin in a chat had allegedly suggested the training of IM cadres in Nepal to Riyaz. “Yasin told Riyaz about exploring some private firms like Gorkha Task Force, which gives military training for recruitment into the British Army and the Singapore Police. This was similar to what they impart in Pakistan,” according to the chargesheet. A conspiracy was also allegedly hatched by Yasin and Riyaz to abduct Jews at Pokhara, Nepal, as a bargaining chip to free Dr Aafia Siddique, who has been imprisoned by the US. In 2003, the FBI wanted Siddique for her alleged links with the Al-Qaida. She was later arrested in Ghazni, Afghanistan. Looking at private firms that provide training for recruitment into the British Army and the Singapore Police. 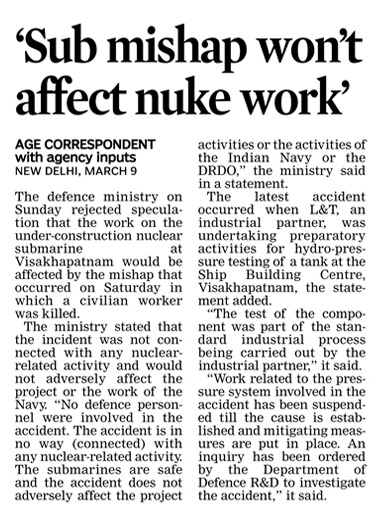 A day after a worker was killed in an accident at an under-construction nuclear submarine at Visakhapatnam, the Defence Ministry issued a statement saying that the incident was in no way connected with any nuclear-related activity and would not adversely affect the project or the work of the Navy. The MoD plans to build four nuclear-powered submarines. While the Arihant is getting ready for final sea trials, other vessels are in various stages of development. Today’s statement by the MoD was aimed at controlling any adverse impact the accident would have had on India’s international image and its aim of dominating the Indian Ocean. “The accident is in no way related with any nuclear-related activity. 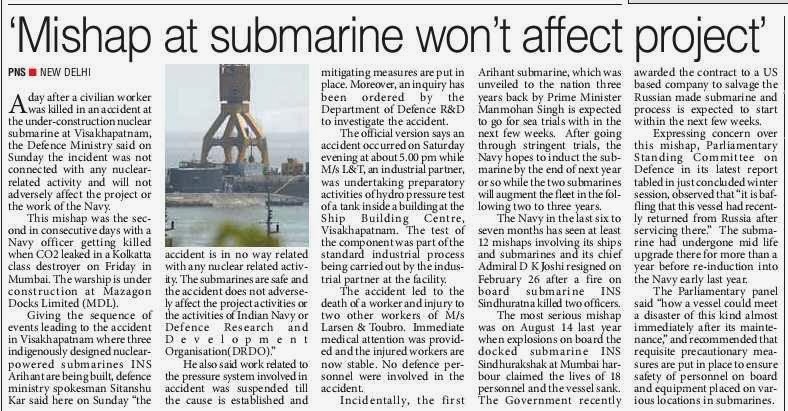 The submarines are safe and the accident does not adversely affect the project activities or the activities of Indian Navy or Defence Research and Development Organisation (DRDO)”, MoD spokesperson Sitanshu Kar said. The accident took place yesterday around 5 pm, when Larsen and Toubro, an industrial partner of the DRDO, was undertaking preparatory activities for hydro-pressure testing of a tank at the Ship Building Centre, Visakhapatnam. One L&T employee was killed and two others were injured. No defence personnel were involved in the accident. First reports had filtered out by midnight. 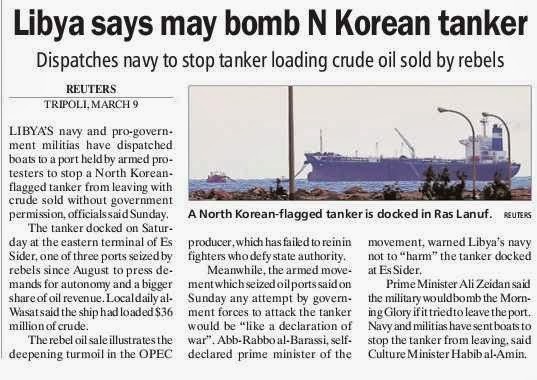 Sources said the accident occurred at the ship-building yard but it was nowhere near the submarines and will not hamper the progress in anyway. “The work on the pressure system has been suspended till the cause is established and mitigating measures are put in place. 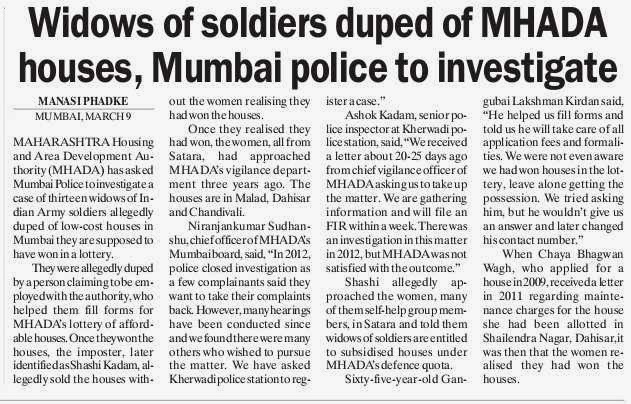 An inquiry has been ordered”, the MoD said. China has a strong fleet comprising 55 nuclear-powered submarines. 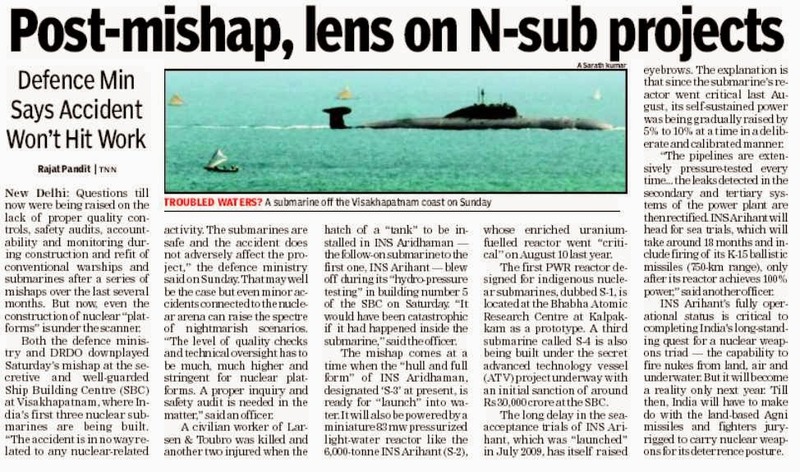 The INS Arihant and its other vessels will provide the Navy a ‘second strike capability’. These will carry nuclear-tipped missiles that can be fired while the vessel is submerged. In naval terminology, a nuclear-powered submarine capable of launching a nuclear missile, is classified as ship submersible ballistic nuclear (SSBN). Each of the vessels will cost Rs 15,000 crore. The project is been jointly undertaken by the Indian Navy, Bhabha Atomic Research Centre (BARC) and the DRDO at the dockyard in Visakhapatnam. Besides the Russian expertise, other companies involved in the development of the submarine are Tata Power, a division of Tata Group, and Larsen & Toubro, a technology, engineering, construction and manufacturing company. 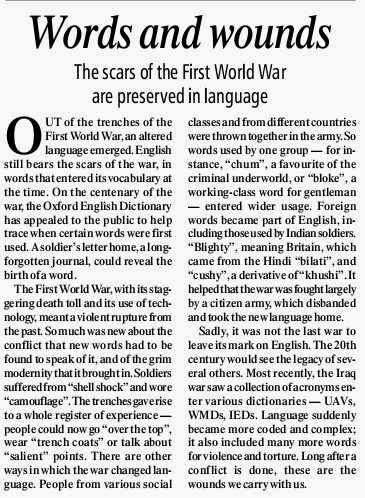 One of the problems that have been cited is that Indian armed forces personnel are often not posted for too long at any particular place. This raises a question: From where should they cast their votes? The third option, that of the personnel registering themselves as “service voters” at the current posting, has not proved to be successful so far. Yet it is perhaps the best option and now even the Supreme Court is examining the possibility of grant of voting rights to armed forces personnel in constituencies where they are posted at the time of elections. The right of the soldiers to vote at the place of their posting has been recognised since 1971, but it was effectively thwarted by the Army, which issued a Special Army Order in 1972 that stated that all personnel are entitled to vote only through postal ballots and proxy. 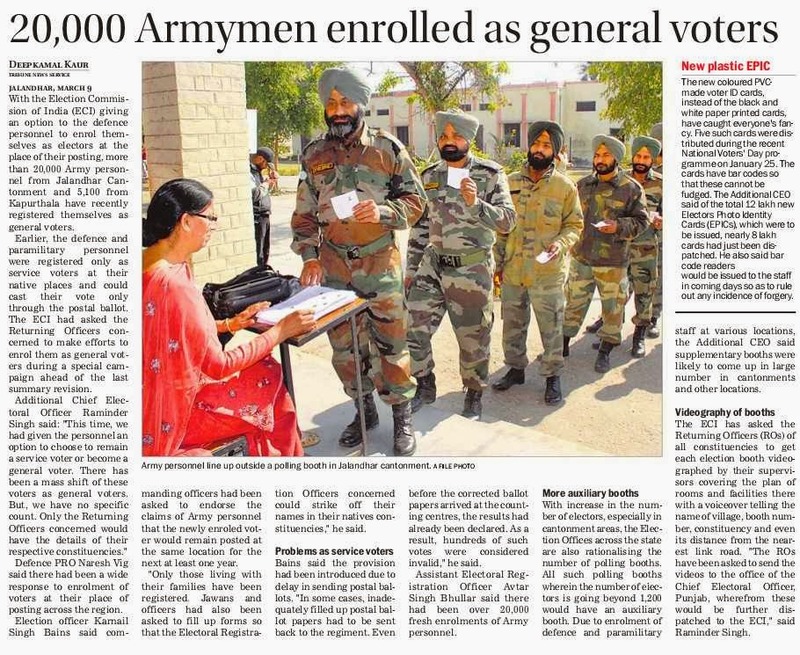 Since it is obvious that armed forces personnel are shifted often, and as such many would not be able to meet the existing Election Commission requirement that the soldiers need to serve for at least three years to vote in a particular constituency. Some adjustments must be made and regulations amended to allow our jawans and officers to vote. Do we have the Army we need? DONALD Rumsfeld, who was America's defence secretary during the Iraq war, pointed out that you fight with the army you have rather than the one you want. This truism underscores the basic responsibility of a defence minister: to maintain and hone during periods of peace the army that will be needed during times of conflict. Every war is different. Armies train to fight the next battles rather than repeat previous ones. The set-piece formations of military engagement now seem what they are, history. The enemy no longer necessarily wears a uniform, creating a dysfunctional battlefield. It fights as a disparate militia, in bands that slip through populations like Mao Zedong's famous fish in water. But Mao's guerrilla fish were all red, and obeyed the command structure of a Communist party. These bands answer to just their frenzied imaginations. The fighting units of a loose trans-national conglomeration like Taliban and its partners hit when they can, and rest when they cannot. It is a war of attrition. They do not have artillery or an air force, but they have numbers, motivation, firepower, objectives and that invaluable resource called time. These methods have seen off the Soviet Union as well as America-led Nato from Afghanistan, which is a significant military achievement. Politically, they are leading the crusade to turn Afghanistan and Pakistan into a theocracy that will spread out and engulf adjacent regions where Muslims live, like Kashmir in India, Xinjiang in China and of course the many “stans” of Central Asia which still believe in a non-theocratic state. It is easy to be gulled by seeming contradictions. 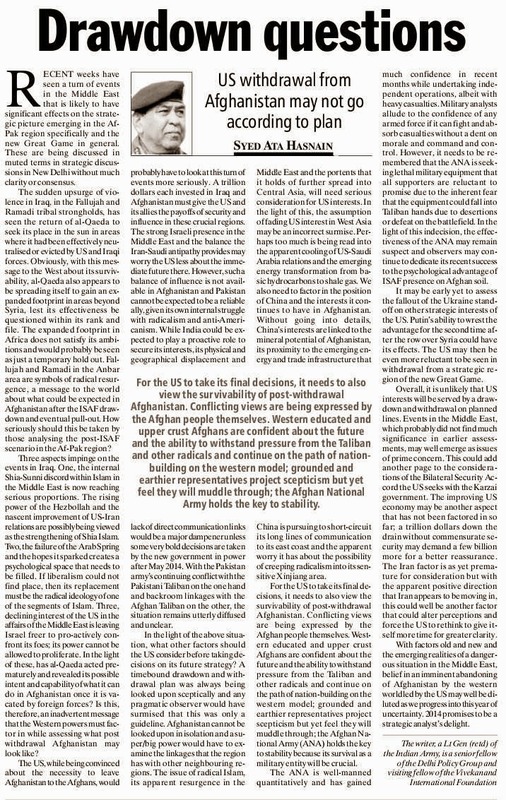 Taliban and Lashkar-e-Taiba might, in their confrontation with India, serve as terrorist ancillaries of a larger and older war, even as they pursue their dream of changing the nature of the Pak and Afghan state. But for them these are two sides of the same ideological coin. They have the freedom to expand strategies with impunity. 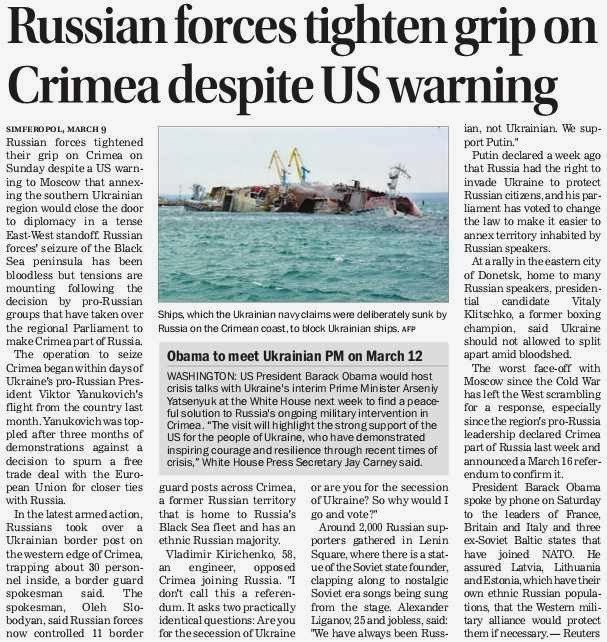 Newspapers are already giving us a glimpse of what the withdrawal of Nato from south and central Asia will mean. There is a visible sense of triumph as theocratic forces pause and regroup in their long march towards the “liberation” of “Muslim lands.” They do not accept the concept of a secular state; for them Muslims, whether in India or Pakistan or China, who believe in secular societies are enemies twice over. We know only too well how difficult it was for the Indian Army to restore peace in Kashmir after the onslaught that followed the collapse of the Soviet Union in Afghanistan two decades ago. Today, China is also on their radar, as are southern Russia and Central Asia. Just a few days ago, China was shocked by an unprecedented terrorist attack, when men dressed in black and armed with knives suddenly descended on commuters at a railway station, spreading mayhem. Terrorism has escalated sharply in China's only Muslim-majority province, Xinjiang. Beijing prefers to mask its worries, but this mask has begun to peel. At some point, China will have to reassess the cost-benefit ratio of its relations with Islamabad if terrorists continue to use Pakistan as their fortress. The question before Delhi is simple: are we prepared for a multi-dimensional conflict where the struggle against terrorists could conflate with conventional war if provocation multiplies? The answer is pessimistic. One of the great casualties of indecisive government in the last five years has been India's defence preparedness. 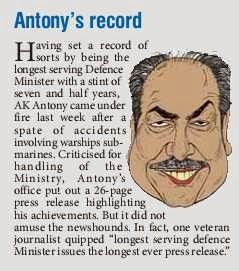 Under the inert, comatose and debilitating leadership of Defence Minister A.K. 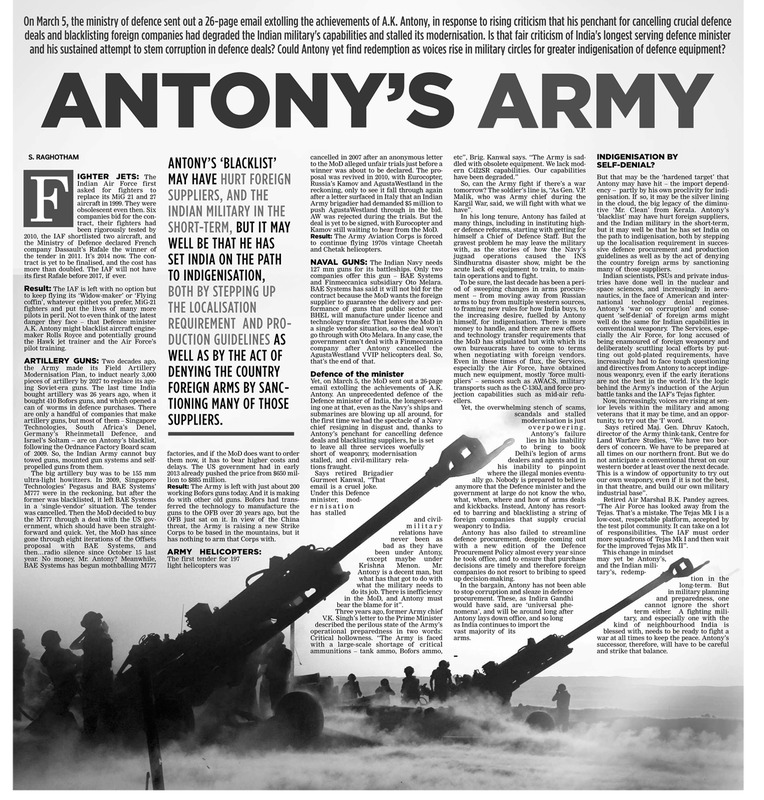 Antony, India's security capability has weakened, even while tensions have risen. Our equipment is degraded; essential purchases have been neglected. The collapse of morale in our Navy is only one symptom of a prevailing disease that is gradually immobilising the nerve centres of our defence. There has been no political accountability. The enemy is at the door, and Antony is in a stupor. If nothing else, at least the coming elections will ensure that India has a new defence minister by June. But the amount of repair and reconstruction needed is enormous, and time is very short. The scenario in the region is changing rapidly, and not for the better. We are facing a decade of high risk. This will demand a new approach in our foreign policy as well. An enemy's enemy does not automatically become a friend, but he can become an associate on the battlefield. India and China may need each other more than they suspect. Russia will not need persuasion for it understands the danger to Central Asia. Ideally, Pakistan should be equally wary of gun-toting theocrats, but perhaps it will take a deeper crisis to bring such clarity. What China and Pakistan do is for them to decide. India must fight its own battles. But battles are fought by armies. Do we still have the one we need? A secret Army unit credited with saving thousands of lives is earmarked to be cut by a half ­because it is short of troops, reveals the Sunday People. The shadowy Joint Support Group recruits foreign agents in war zones to provide vital intelligence . Operatives have taken huge risks to “turn” members of al-Qaeda, Iraqi ­insurgents and Taliban warriors. They have to learn Arabic and Pashto – the language of Afghanistan – and are expected to work alone or in small cells deep behind enemy lines. Defence sources claim their work in Iraq and Afghanistan in the past decade has saved the lives of hundreds of ­soldiers and thousands of civilians. And intelligence garnered by the unit has led to the death of dozens of top terrorists such as Abu Musab al-Zarqawi, the leader of al-Qaeda in Iraq. Scores more have been captured, ­including 65 Taliban commanders in strife-ravaged Helmand ­province in just 18 months. But the unit – part of the Intelligence Corps – now faces a 50 per cent cut ­because it cannot recruit enough troops of the right calibre. The JSG is made up of four squadrons plus a headquarters and training wing. Each squadron should have 100 men and women. But the unit has struggled to reach those numbers in recent years. Now the Ministry of Defence want to cut it to two squadrons after British forces pull out of Afghanistan at the end of this year. The JSG has worked closely with the UK’s intelligence services MI5 and MI6. A number of its members are ­currently seconded to them. But a source said: “Its future has been in doubt for a long time. Secret units are not popular in the Army because top brass find it hard to control them. The JSG recruits men and women of any rank from all three services up to the age of 42. Wannabes undergo a two-week pre-selection course to weed out those not thought able to ­handle agents. But any who get through then spend four months at the corps’ HQ at Chicksands, Beds, being taught skills such as hand-to-hand combat. They also learn to befriend people they may despise, win their trust and persuade them to turn traitor. Troops who pass that course can expect a posting to global danger spots such as the al-Qaeda hotbed of Yemen. A pro-Russian military force sealed off a military airport in Crimea as tension rose ahead of a planned vote on the region’s future. The 80-strong unit of armed men set up machine-gun posts along the landing strip in Saki with the help of civilians wielding sticks and clubs. It was the third airport seized by Russian forces and came as the takeover of Crimea spread over the weekend. Soldiers also seized a border post in the west of the region. Meanwhile BBC reporter Ben Brown was caught up in clashes when a mob of Russian supporters, including some armed with baseball bats, fought rival protesters in Sevastopol. 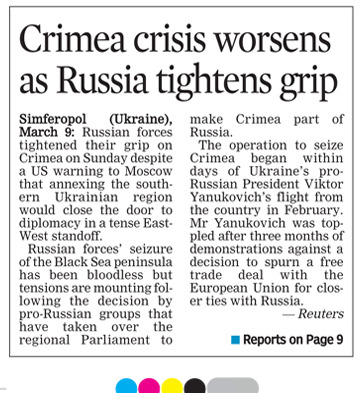 Some of the anti-Moscow demonstrators in Crimea told reporters they would not take part in next Sunday’s referendum on whether they want the territory to split from Ukraine and join Russia. Foreign secretary William Hague said he doubted the vote would be ‘free or fair’ and warned Moscow risked being isolated from the rest of the world. In Kiev, Ukraine’s interim prime minister Arseniy Yatsenyuk vowed not to give up ‘a single centimetre’ of land to Russia. He will fly to the US on Wednesday to meet president Barack Obama at the White House. In Britain, David Cameron again spoke with Russian president Vladimir Putin as each side expressed a ‘common interest’ in scaling down the crisis.